ORPALIS, producer of the GdPicture series of development toolkits wins ComponentSource top 25 leading publishers award. GdPicture.NET Document Imaging SDK Ultimate Edition wins top 50 bestselling products award and ranks number 30. [GdPicture.NET 11] now covers all the technology needed for WinForms and Web development. Since joining ComponentSource in 2009 ORPALIS and its GdPicture line of products have won each year bestselling publishers and products awards. For the years 2014-2015 ORPALIS stays in the top 25 publishers and GdPicture.NET Document Imaging SDK Ultimate edition enters the top 50 bestselling products and ranks number 30. ComponentSource grant their awards based on real sales orders placed by their customers globally during the year 2014. The GdPicture line of development toolkits was started in 2003. In 2009 GdPicture becomes GdPicture.NET Document Imaging SDK. In January 2015 the version 11 of the toolkit is made available to the public: it now covers all the technology needed for WinForms and Web development. GdPicture.NET v11 is delivered as .NET, WinForm, ActiveX, WPF and ASP.NET components. The Ultimate Edition is the all-inclusive toolkit Edition of the GdPicture.NET SDK series. All document imaging, image processing and document management features are included, as well as all optional modules (PDF, annotations, barcoding, OCR, OMR, MICR, DICOM, JBIG2, automatic color detection) making this Edition the most comprehensive development toolkit of the market. GdPicture.NET Document Imaging SDK version 11 can be tried for free for 30 days. Download and trial key for 30 days are available on the GdPicture website. ORPALIS is specialized in automating large-scale document-based processes and document imaging. ORPALIS is creator, developer and owner of the comprehensive document imaging toolkit series released under the brand "GdPicture", which is now a worldwide known and respected leader in imaging technologies. More than 12,000 developers based in over 70 countries have included GdPicture components in their applications. In 2011 ORPALIS releases PaperScan, marking the beginning of a new line of products meant for end-users. PDF Reducer is launched in 2013. In 2015 a most powerful universal HTML5 viewer and document management kit called DocuVieware is made available to the public. 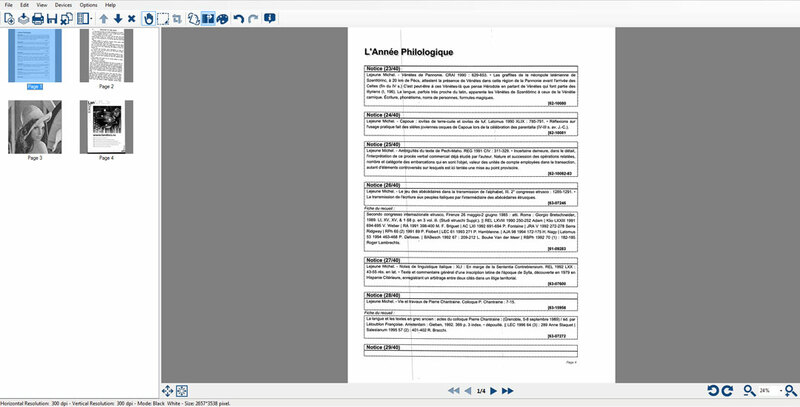 The same year a software tool for converting documents into PDF/OCR, the ORPALIS PDF OCR, is launched.